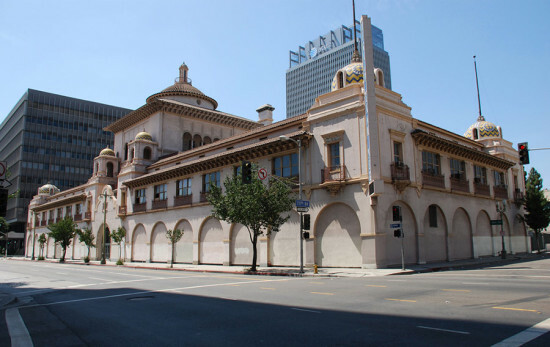 Another symbol of downtown Los Angeles' transformation is the ongoing renovation and rebranding of the Spring Arcade Building. Modeled after the great Beaux Arts arcades of Europe, the space has long been a grubby home for non-distinct shops. 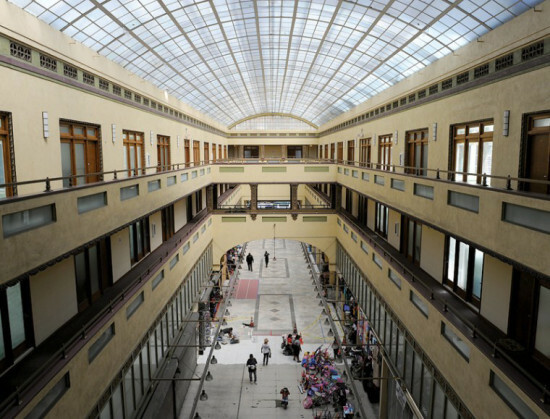 The Arcade—actually two 12-story towers connected by the skylit, glass roofed, three-level arcade—was built in 1924 by architects Kenneth McDonald and Maurice Couchot. With its Spanish Baroque entryway, it originally contained 61 shops, and later added a Venetian-style bridge across its center. 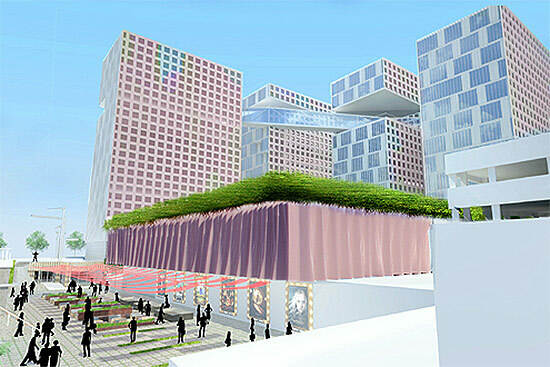 It now contains space for 21 shops and restaurants and still contains the landmark KRKD radio towers on its roof. Developers Downtown Properties have cleaned the arcade's glass roof, which had been opaque with grime, and they're bringing in notable retail like Guisados tacos (which just opened on Monday), ULI Gelateria, Royal Claytons Pub, and Bier Beisl Austrian foods. Above the arcade, apartments in the structure range from 590–1,600 square feet. The new shops and residents raise the continuing specter of gentrification, particularly with anchors like the Ace Hotel, Urban Outfitters, and Acne nearby. But just walking down the long-neglected, shabby street is evidence that it's still a little ways off. 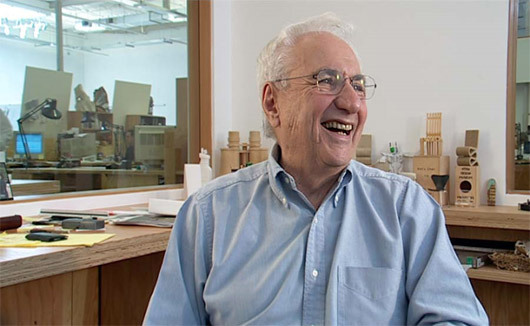 Some people say Los Angeles is run by the entertainment business, but starting this Thursday the city will belong to artists and architects. Well downtown will at least. 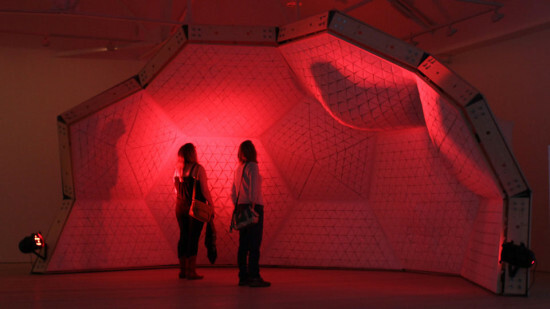 As part of the first-ever Skyline Festival (February 13-22), local designers will be mounting ten installations within a 10-block radius in the city center. 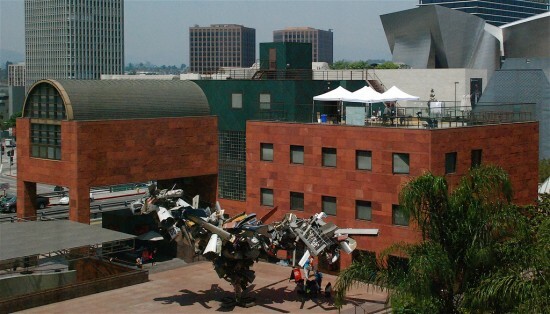 The event is sponsored by LA-based LERATA, which stands for Laboratory for Experimentation and Research in Art, Technology, and Architecture. As you wander around, you'll be able to see architect Filipa Valente's Liminoid Garden, a "bouquet" of mechanisms equipped with electronic controllers that receive readings of light, temperature and pollution and reinterpret them into movements and light changes located in the penthouse of the Cooper Design building. Another stop, inside the Palace Theater on Broadway, will be Guvenc Ozel's Cerebral Hut, a wood frame truncated icosahedron covered in stretchy fabric and moving subtly with the help of plastic pistons. Inside 724 South Spring Street (AN's new home), Behnaz Farahi will present Living Wall, a 3-D, interactive wall that can change shape in response to visitors. And inside the Alexandria Apartments on Spring Street you can visit Juan Azulay and Benjamin Rice's The Passenger, described by the artists as a "celestially enabled interactive micro-planet that engages passing-by inhabitants through releasing its own moody mediated weather system for an experience of immersion and communication with a new planetary logic." We never said the pieces wouldn't be weird, did we? 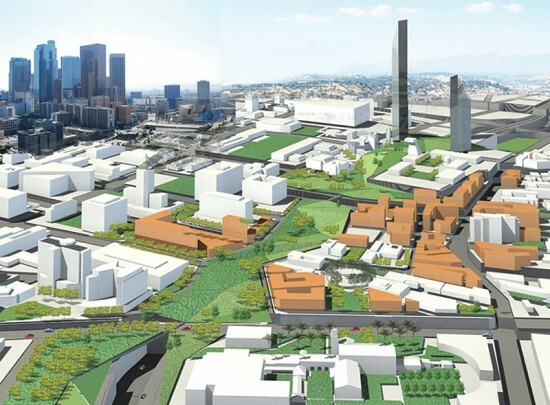 Downtown LA Update: Streetcar Moving, Tower Trading, Stadium Stalling? In recent weeks we've seen a number of important developments in Downtown Los Angeles, like the groundbreaking of the Arquitectonica-designed apartments on Grand Avenue, and the topping out of The Broad next door. The red-hot area continues to make headlines, from the advancement of its upcoming streetcar to the murkiness of its proposed football stadium. •The city's Downtown Streetcar, which last month received funding from a tax on downtown residents, has gotten more good news. According to Curbed LA, LA City Council on March 7 approved an operational plan committing up to $294 million of Measure R transportation tax money to cover the operation and maintenance of the system. 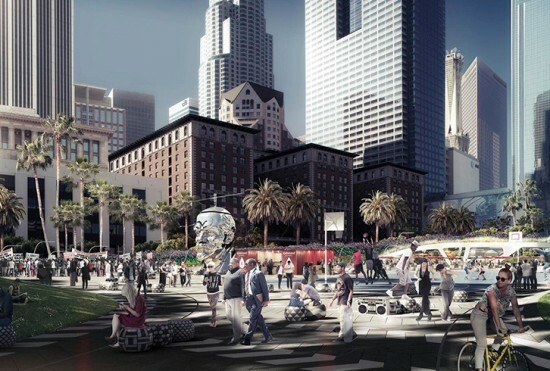 The streetcar will travel in a loop along Broadway, Figueroa Street, and other main thoroughfares between the city's Civic Center to its Convention Center. 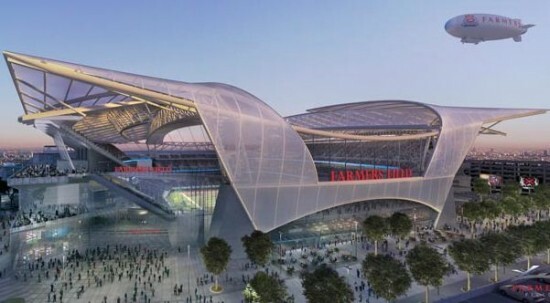 •According to Yahoo Sports, anonymous sources in the NFL have said that AEG and Gensler's Downtown LA stadium (rendered at top) in South Park is looking less and less likely. "The numbers just don't work, no matter how you look at the deal," a "league source" told Yahoo. "It's either too hard for AEG to make money [and pay the debt on the stadium] or too hard for the team. I just can't see a way for it to work." Some have said that the NFL favors a new stadium in Chavez Ravine. Stay tuned. 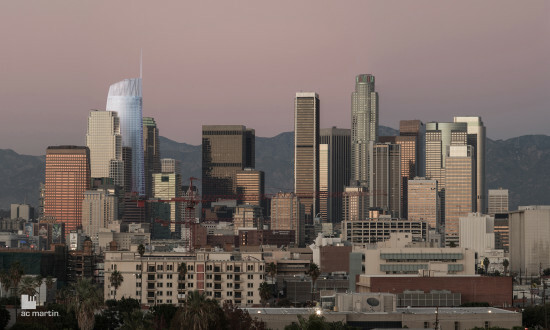 •The LA Times reports that Singapore developer Overseas Union Enterprise has agreed to buy the Pei Cobb Freed-designed, 72-story U.S. Bank Building, the tallest building in California. 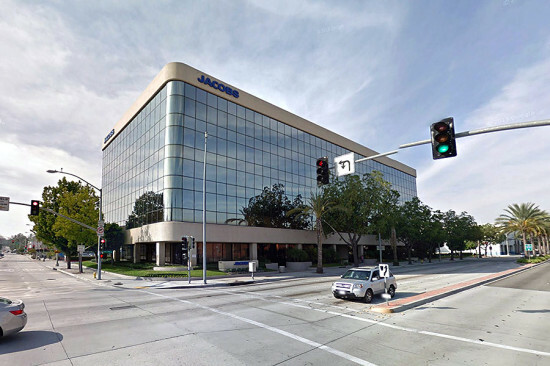 The developer will be buying the building from MPG Office Trust for $367.5 million. 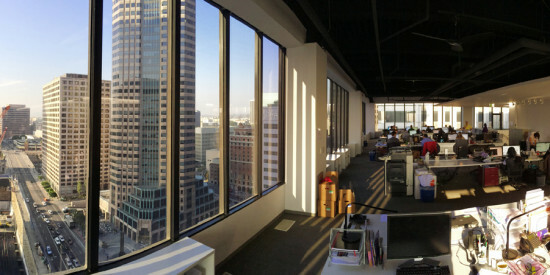 "Its cylindrical design is an inefficient layout for an office building," real estate analyst Jed Reagan of Green Street Advisors told the Times.